Does it still count as a makeover if I didn’t really buy anything new for the room? I guess it just means it was a cheap makeover. And this was a surprise makeover, which is my favorite kind! 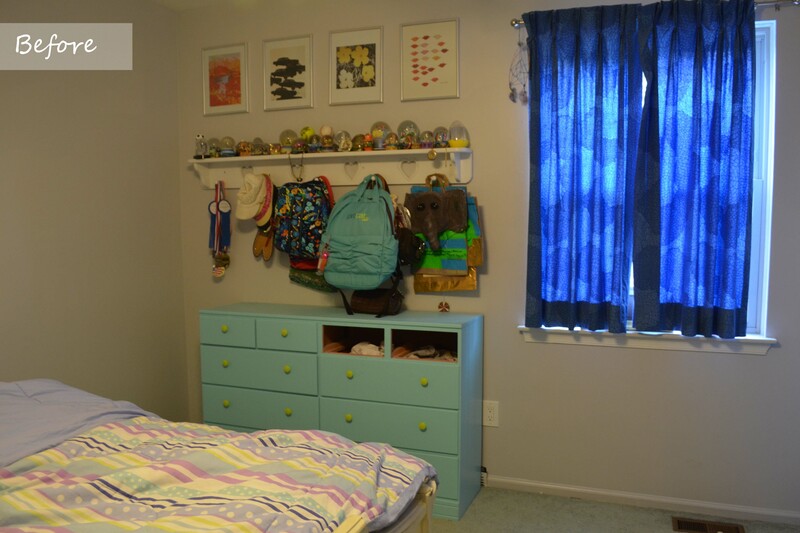 I have compiled some pictures to show you the evolution of Smart Jr’s room, but I put those in another post in hopes of keeping this one a little more focuses on this weekend. But be sure to check out Evolution of a Room. This is the before and after from this week. I am in the process of replacing the carpet in all the rooms upstairs. Yes, as in I am replacing the carpet, not hiring someone else. The hardest part is moving all the stuff out of the rooms, which is one of the reasons why I like doing it myself, so I can do just one room at a time. 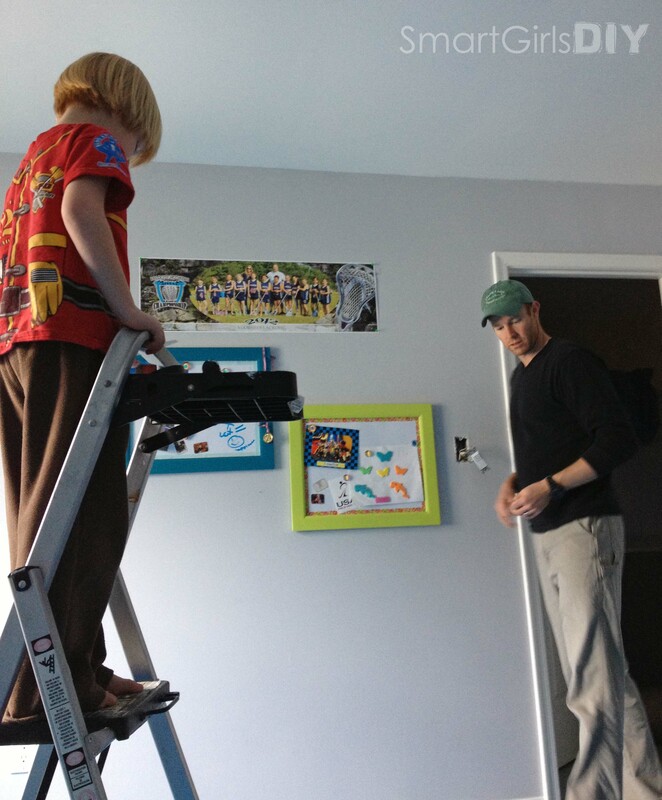 First I did my son’s room, read that post here. And then this weekend was Smart Jr’s turn, read that carpet post here. 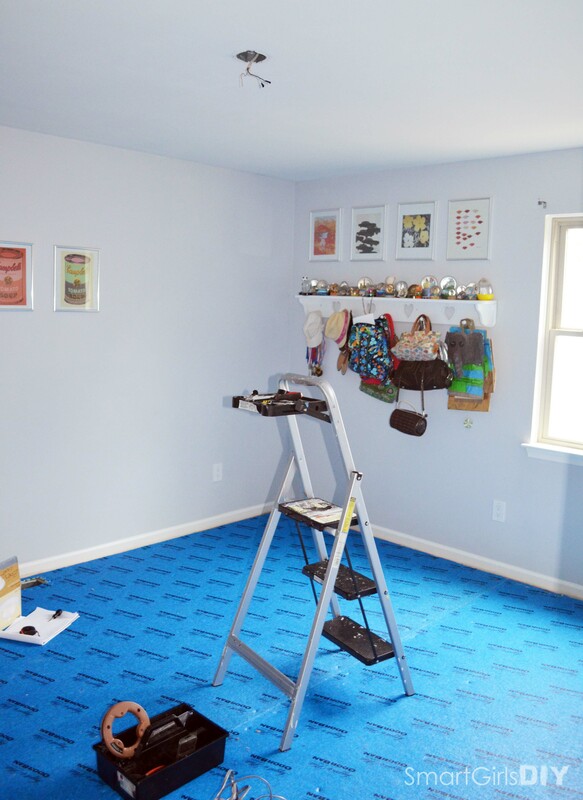 I always think that while you’ve got the carpet out, you might as well re-paint a room. Except SJ didn’t want to change the color of her room. She chose that color when she was 7 and hers was the first room I painted when we moved into this house. I actually painted the living room the exact same color. Yeah, my 7-year-old had good taste! 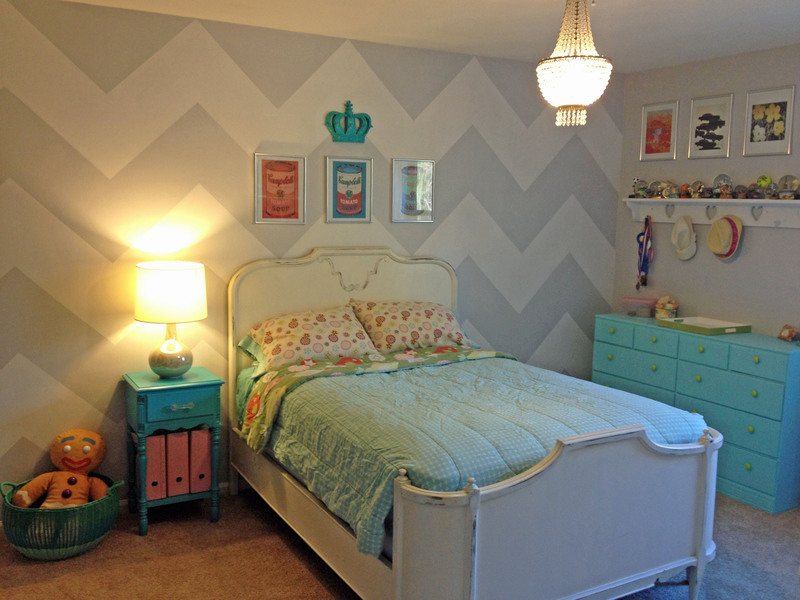 So instead of painting the whole room, I painted a large chevron pattern, which she had been asking for. I chose the color white. And of course I already had white paint, so that was free. First we emptied the room. Just like they do on TV. It really does help to start fresh. 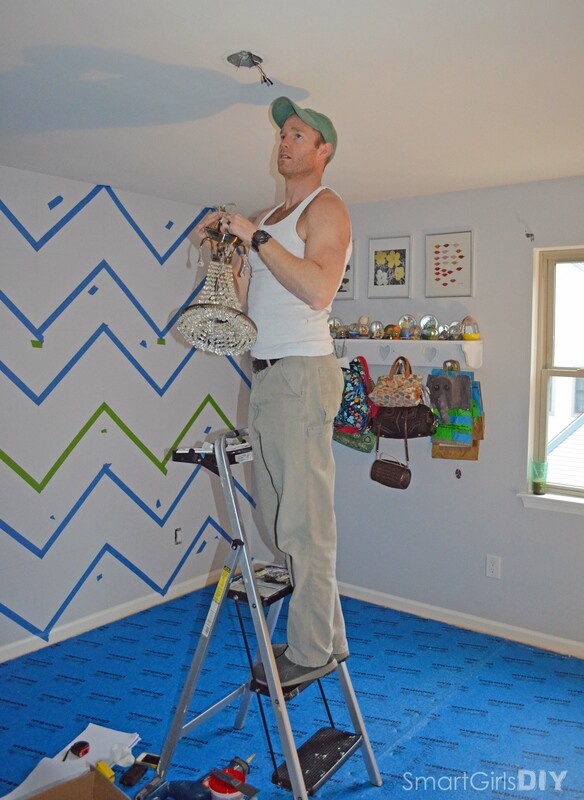 I often try to skip this step and paint an entire room by pushing everything into the middle of the room. This room definitely benefited from an empty slate. Smart Jr brought all her “stuff” and dumped it in my room. 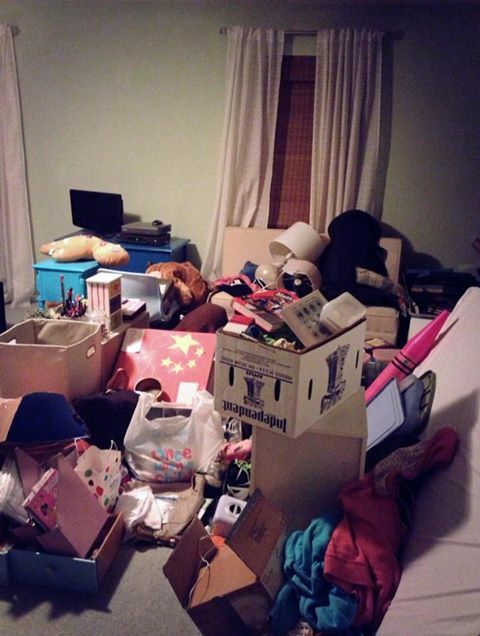 Her desk and dresser took up almost the entire hallway. 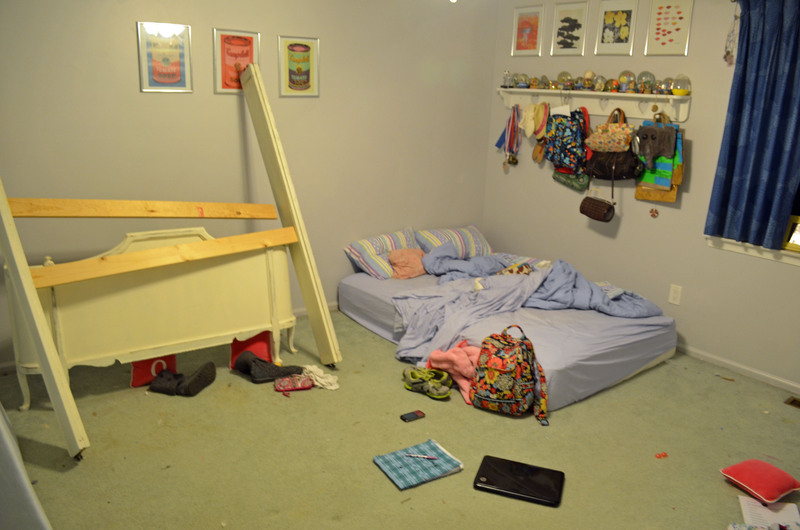 And her bed, box spring, and 3 doors went in her brother’s room. 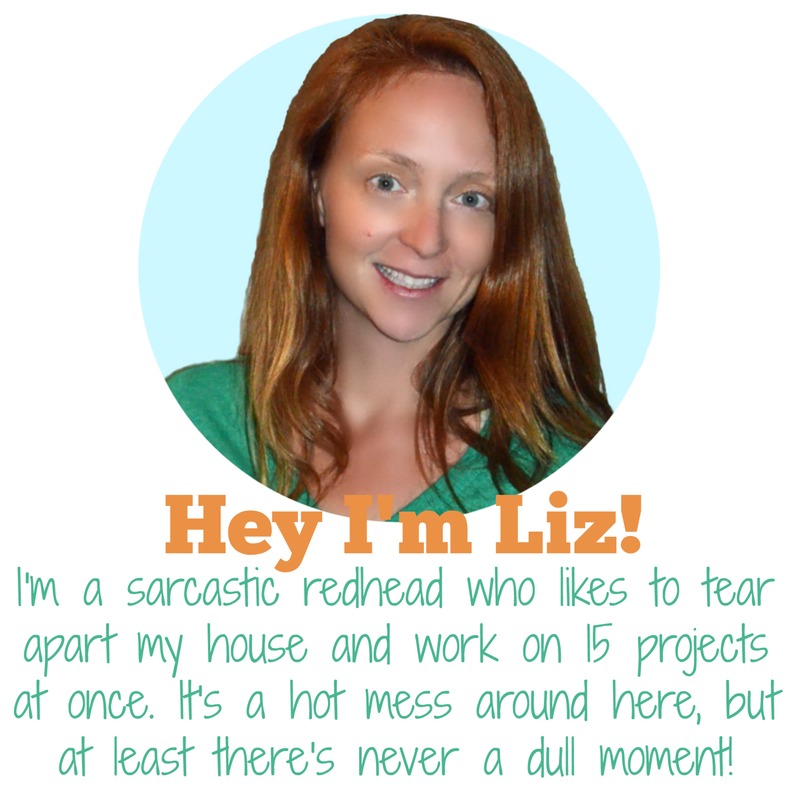 It was a hot mess! Obviously she knew I was doing something to her room, but all she knew about was the carpet. I tore the old carpet out on Thursday, so that doesn’t really count as the weekend. The real work didn’t start until I dropped SJ off at church on Friday afternoon. She went to Ocean City, MD on her first youth group trip. She had a blast, by the way! 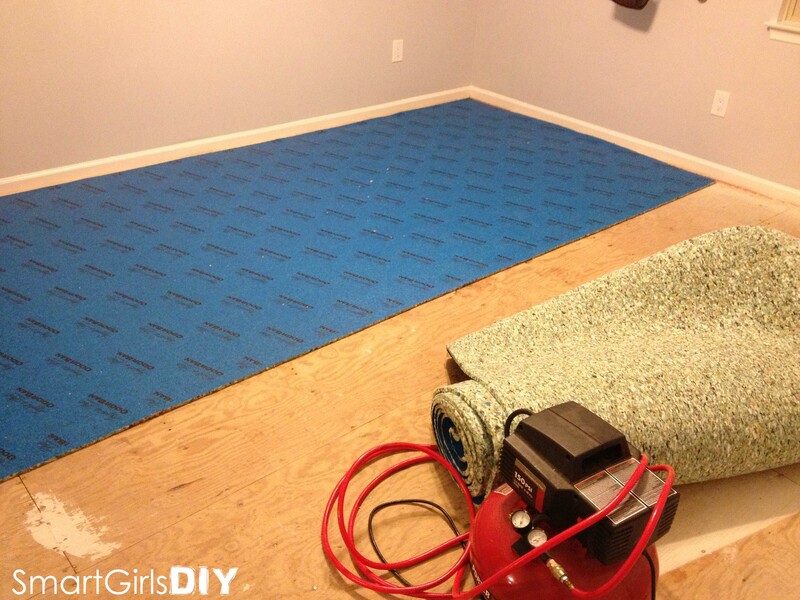 I installed the carpet pad Friday night, then went to bed so I could rest up for a full day of work. 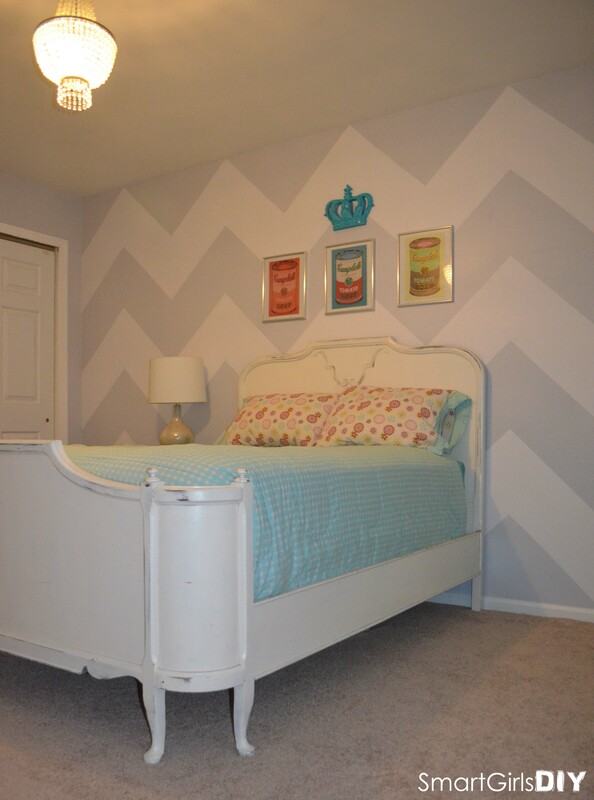 Saturday morning I worked on the pattern for my chevron wall, while my husband got to work taking down the ceiling fan. Here’s the back-story on the lighting situation in our house… In our 4 bedrooms, 3 had ceiling fans when we moved in. My son’s room was the only one without. He has no overhead light at all. Hubby replaced 2 of the 3 ceiling fans with new ceiling fans. (And yes, I know ceiling fans are a big faux pas, and I never thought I would purchase one and voluntarily put it in my home. But boy, they are nice to have in the summer time! Plus I really like the one I bought for my bedroom.) NONE of the rooms were wired to turn the light/fan on and off from a switch. Yet all the rooms have a switch just inside the door. ANNOYING. Even after 4.5 years living here, I still try walking in a room and flipping the switch to turn the light on. Duh. In my defense, two of the rooms have lamps plugged into the outlet that is operated by the switch, so I’m not that dumb. But I find it annoying to have to use a pull-chain to turn on an overhead light. Especially in a house that was build in the 1980’s, not the 1890’s. 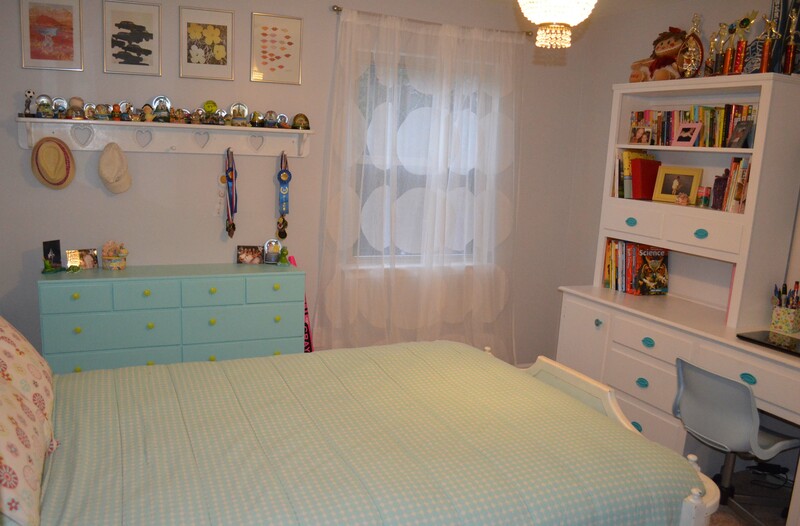 Any-who… Smart Jr still had the original ceiling fan in her room. She had a chandelier in her bedroom at our last house. She loved it so much we took it with us. Mind you I got the thing for like $35 at Home Depot back in 2005, so it’s not an antique or anything. But because she loved it, hubby swapped it out with another light so we could take it with us when we moved. And then it sat in a box under her bed for 4.5 years. She asked several times if Daddy could put it up, but we always put it off because of the whole no switch thing. Well no more! Daddy hooked it up! Lol. He hung the chandelier AND wired it to the switch on her wall. Go Daddy! It cost $.97 for a new con box. And it looks fantastic! Daddy’s looking pretty good too. Here’s Daddy with his little helper. I finished taping the wall before he finished the light. 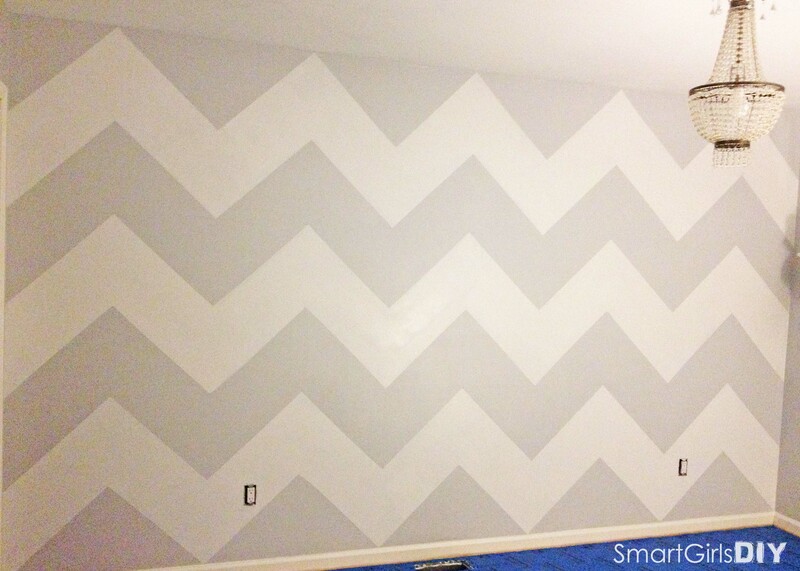 Here’s the complete post on Painting a Chevron Wall. This is what it looked like this when I was finished painting. And after the tape came off. Saturday night was spent installing the new carpet. The complete post is here. The carpet is StainMaster Aristocrat II in Pale Clay. It’s $.98/sq ft at Lowe’s, which is super cheap. 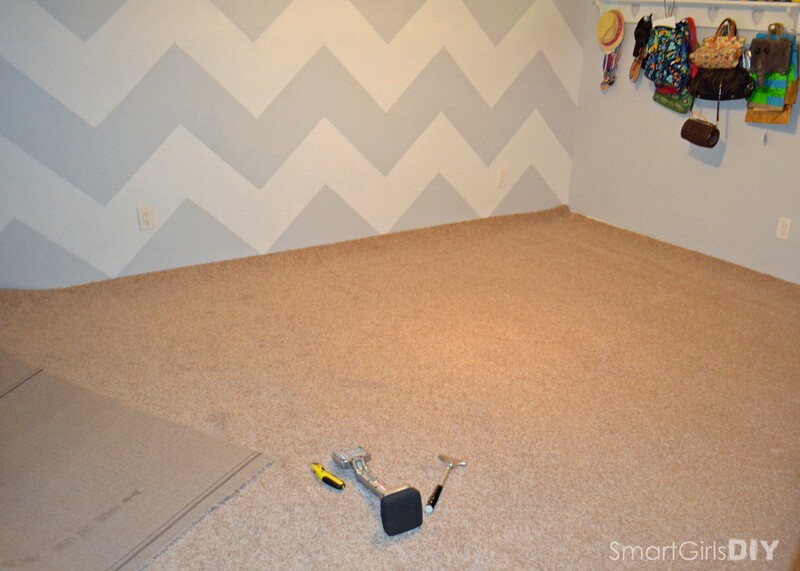 Smart Jr really wanted hardwood floors (like in her old bedroom) but I wanted to keep all the rooms upstairs consistent. Sunday meant time to bring all her stuff back in. Smart Jr was very clear that she wanted to keep her Andy Warhol prints, so I put the same 3 back over her bed, but added the crown she had spray painted over the summer. She’s a fan of the Keep Calm and Carry On posters and calls this a keep calm crown. It was bright pink when we bought it from Hobby Lobby, but she decided to make it teal. 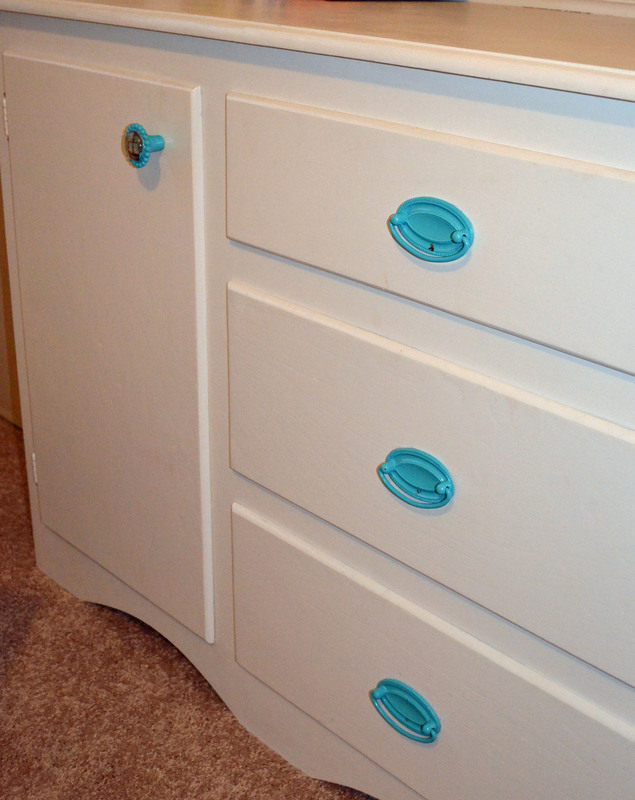 She painted her bed side table the same teal color. She’s had that table in her room since she was 2. It was an ugly brown when I trash picked it. I painted it pink (you can see it in the before picture) and it remained that way until SJ learned to spray paint this summer. I thought about painting her bed. 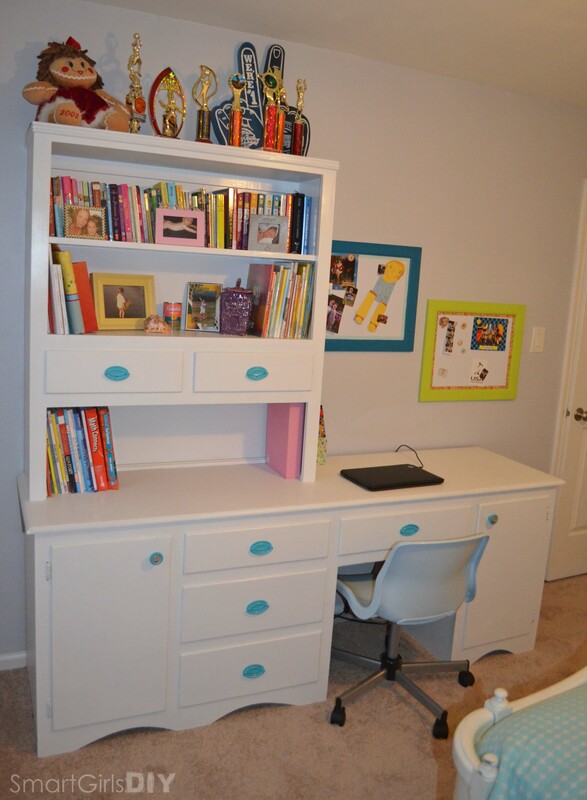 It bothers me that it’s a shabby chic worn white and her desk is a bright clean white. 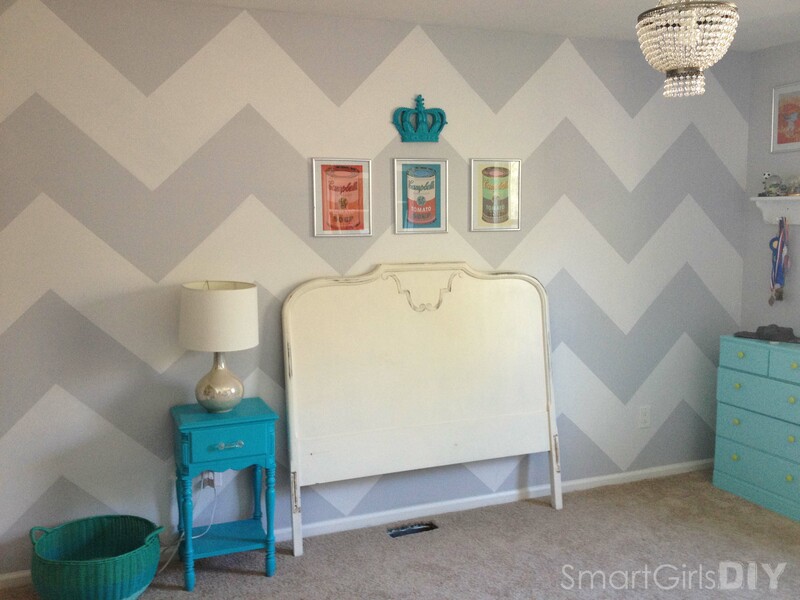 But when I put the headboard up against the chevron wall I thought it looked great, so I left it. Plus SJ and I couldn’t come up with a good color for it. And I’m certainly not painting that desk again. Look here to see what it looked like when we bought it through Craiglist. Oh, I am totally over those dry-erase boards, but Smart Junior painted them, so I’ll leave them up. For a while. 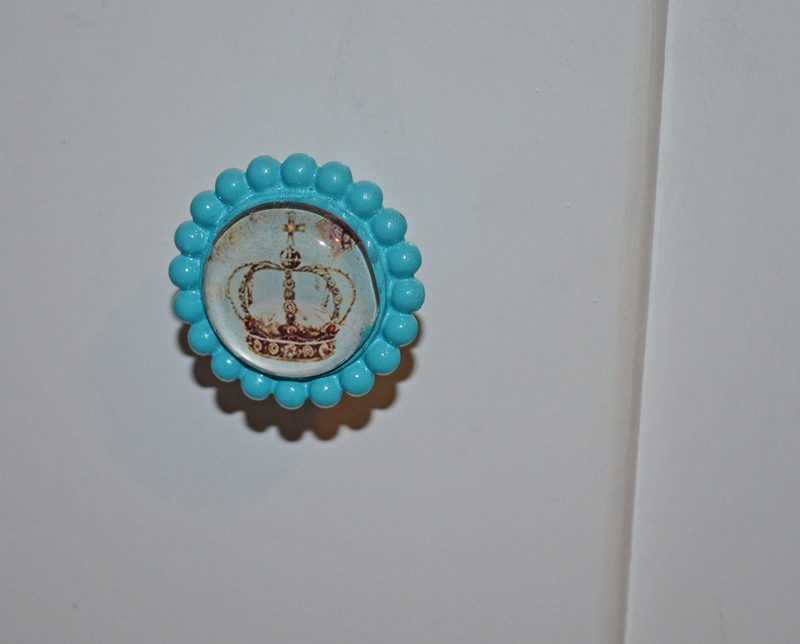 And just like with the side table, I painted these knobs and pulls hot pink when we first got the dresser and she painted them blue this summer. 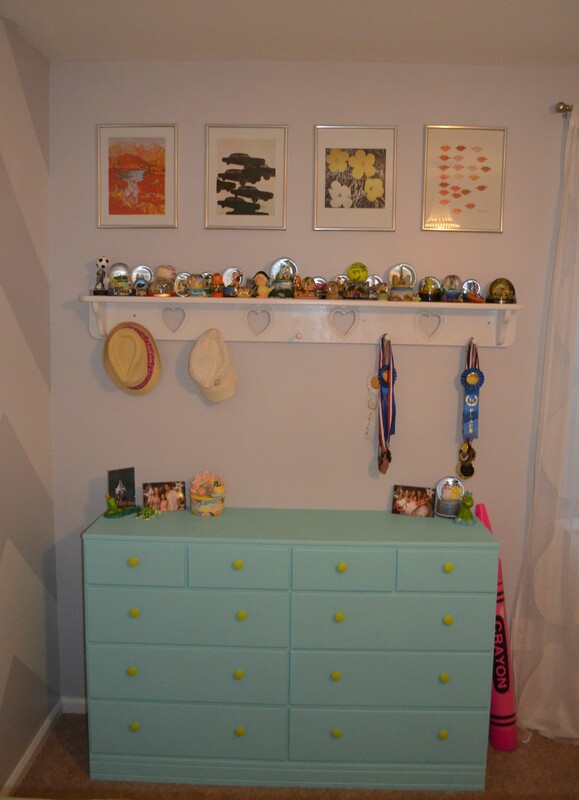 I added a green and white tray to the dresser that snagged from her brother’s room. She keeps her hair brush and stuff in there. It looks slightly neater than having them “out” on the dresser. She got new curtains for free because I took them out of the dining room. 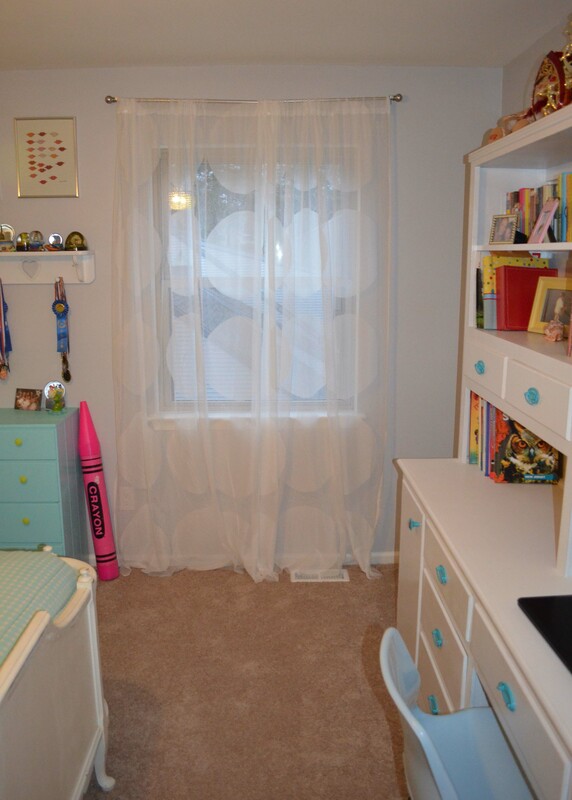 The back-story there is that I end up hating any curtains I hang in the dining room, so I’m always taking them down. These are NINNI TRÅD curtains from Ikea. The pair was $19.99. They still need to be hemmed and I need to add a center support for her curtain rod. I just wouldn’t be me if I actually finished EVERYTHING. Ha! And that’s about it. Everything else she already had. In case you’re wondering, my room still looks like crap. Boo. Great makeover! This is a very chic and cool room for a young girl! And I love that she likes Warhol. 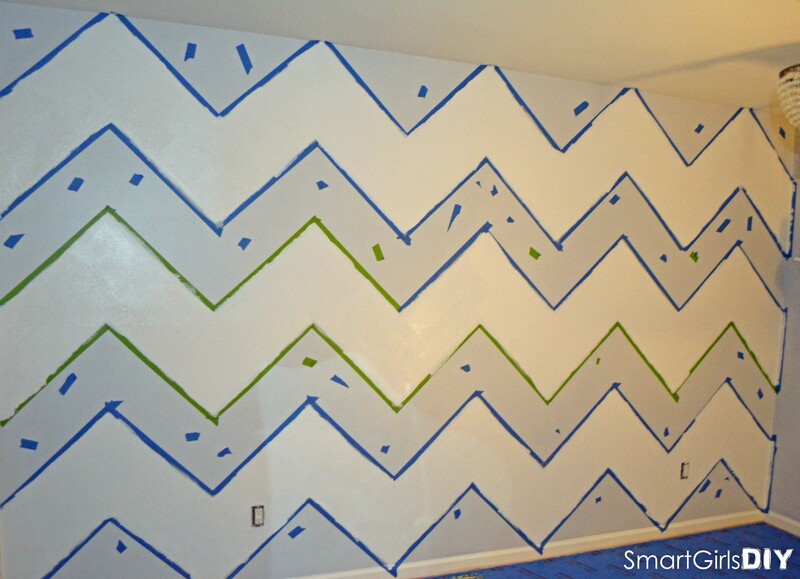 Oooh i really love this one and the chevron painting,been planning to do this for my room in months,might be the thing to push me to actually doing it,thanks!!!!! Thanks! You should totally go for it!! Hi! 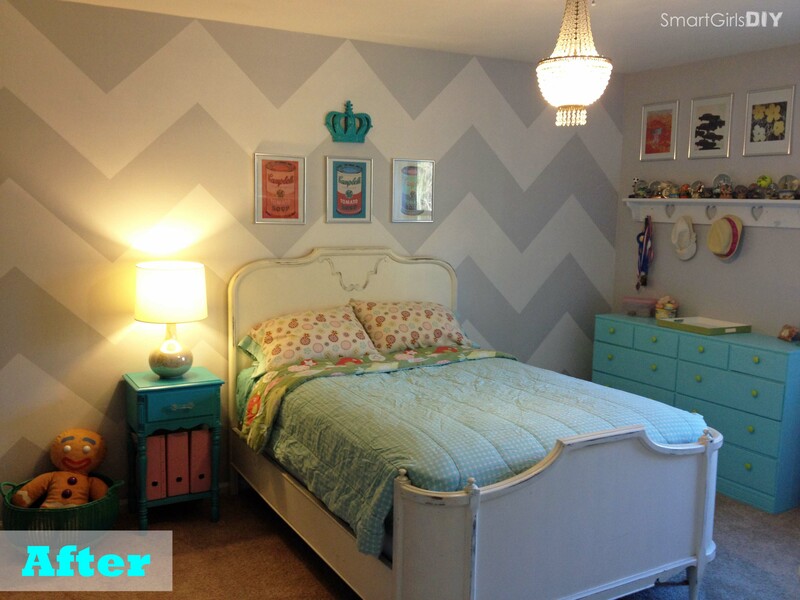 Love the makeover =) I know it’s a stretch but do you happen to have the specs on the gray that is on the walls? I want that exact gray on my bedrooms walls! Hi Marisol, It’s BEHR Misty Morn #PPU12-10 from Home Depot. I hope this helps! Good luck! !